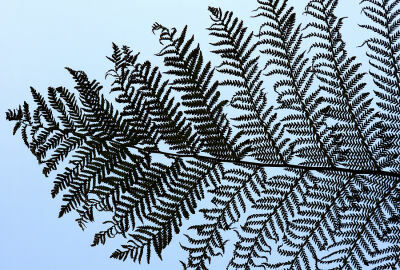 New Zealand has some of the most beautiful ferns in the world and the silver fern is a national symbol. You often see the spiral shape of the unfurled silver fern leaf, the koru, in art, and koru necklaces carved out of bone were (and still are) popular. There are about 190 species of fern in New Zealand, ranging in size from a few centimetres up to 24 metres tall! See some super fern photos here (leaving Activity Village). The silver fern is a symbol of New Zealand and is on the front of the rugby top of the national rugby team, the All Blacks. You can see photos of the rugby tops on the All Blacks website (leaving Activity Village). The national netball team is known as the Silver Ferns and the fern is their logo, too. 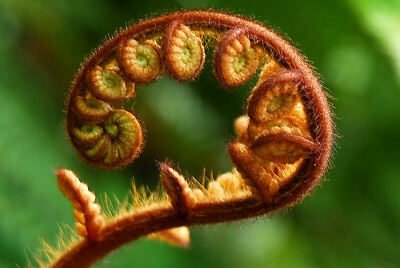 This shape, of an unfurling fern frond, is called a Koru by the Maoris. The shape is another popular symbol of New Zealand and represents the unfolding of new life, fresh starts. 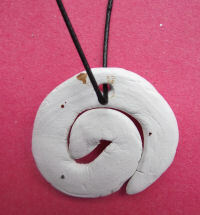 The Maori traditionally carved bone into pendants for necklaces and the koru was a popular shape. You can have a go too with our bone-carving necklaces craft!